with those who go before us. but we all share the same emotions. In the acceptance of death, we honor our loved ones and celebrate our life. The cemetery, one hundred and fifty-two acres in extent, is on a prominent plateau, visible at a distance from the east, south and west. 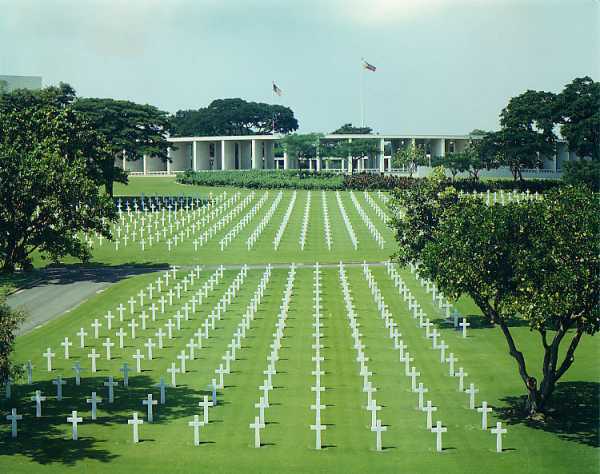 It contains the largest number of graves of our military Dead of World War II, a total of 17,206, most of whom gave their lives in the operations in New Guinea and the Philippines. 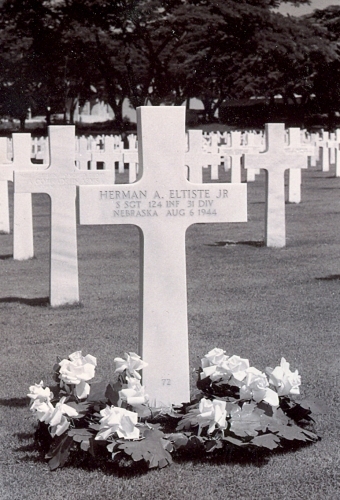 The headstones are aligned in eleven plots forming a generally circular pattern, set among masses of a wide variety of tropical trees and shrubbery. The chapel, a tall stone structure enriched with sculpture and mosaic, stands near the center of the cemetery. In front of it on a wide terrace are two large hemicycles with rooms at each end. Twenty-five large mosaic maps in these four rooms recall the achievements of the American Armed Forces in the Pacific, China, India and Burma. 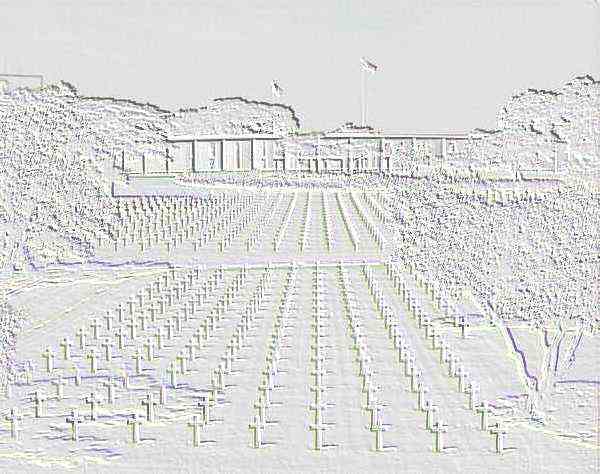 On rectangular Trani limestone piers within the hemicycles are inscribed the names of 36,285 of the Missing who gave their lives in the service of America and who rest in unknown graves. Carved in the floors are the seals of the American states and its territories. 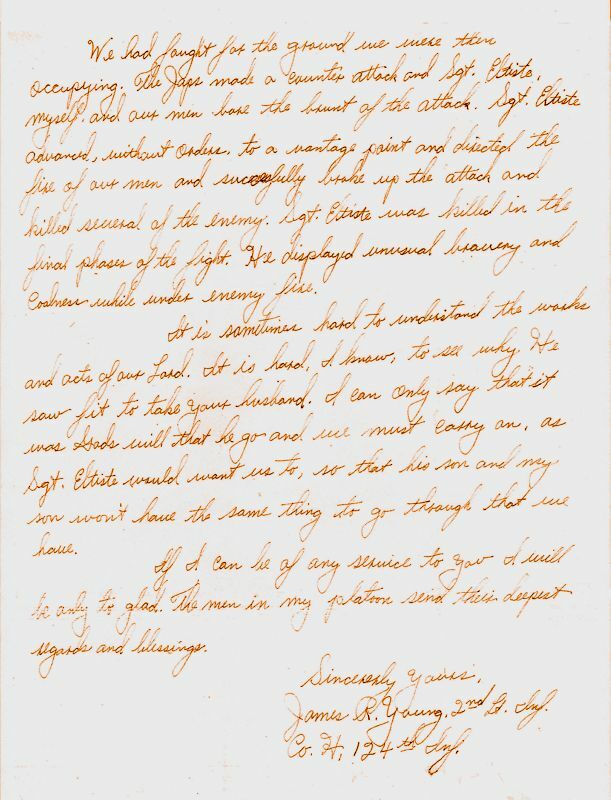 I want to express my deeply felt regret and sorrow caused by the recent death of your husband, S/Sgt. 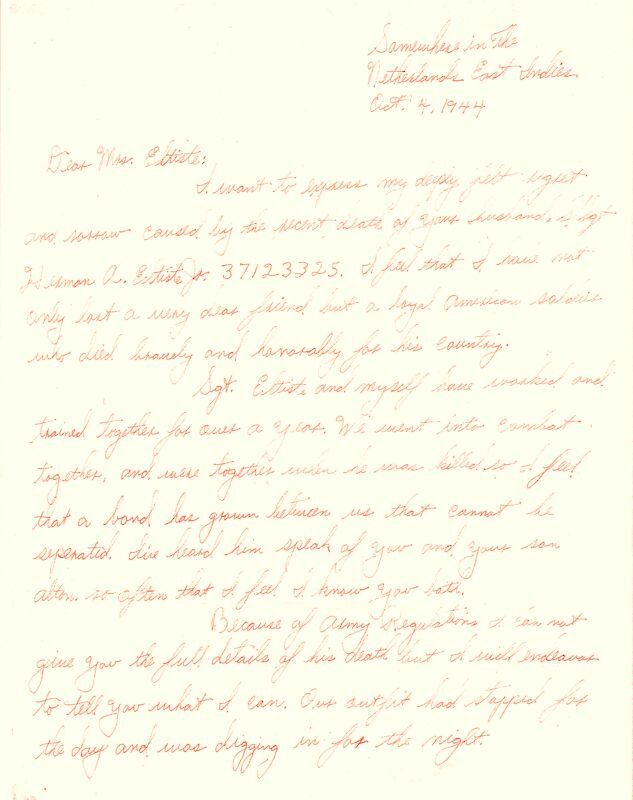 Herman A. Eltiste Jr. 37123325. I feel that I have not only lost a very dear friend, but a loyal American soldier who died bravely and honorably for his country. Sgt. Eltiste and myself have worked and trained together for over a year. We went into combat together, and were together when he was killed so I feel that a bond has grown between us that cannot be separated. I’ve heard him speak of you and your son Alton, so often that I feel I know you both. Because of Army Regulations I can not give you the full details of his death but I will endeavor to tell you what I can. Our outfit had stopped for the day and was digging in for the night. We had fought for the ground we were there occupying. The Japs made a counter attack and Sgt. Eltiste, myself, and our men bore the brunt of the attack. Sgt. Eltiste advanced, without orders, to a vantage point and directed the fire of our men and successfully broke up the attack and killed several of the enemy. Sgt. Eltiste was killed in the final phases of the fight. He displayed unusual bravery and coolness while under enemy fire. It is sometimes hard to understand the works and acts of our Lord. It is hard, I know, to see why He saw fit to take your husband. I can only say that it was Gods will that he go and we must carry on, as Sgt. Eltiste would want us to, so that his son and my son won’t have the same thing to go through that we have. If I can be of any service to you I will be only to glad. The men in my platoon send their deepest regards and blessings. 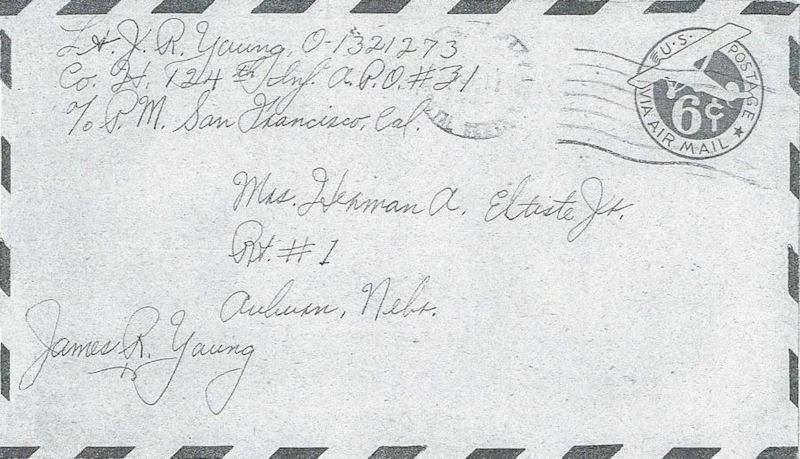 James R. Young, 2nd Lt. Inf.